This week at SecureIt, Ryan and Tom dive into SecureIt’s military roots and how the company came to be. Learn about Tom’s early days of touring military bases across the country and the problems faced by many armories. 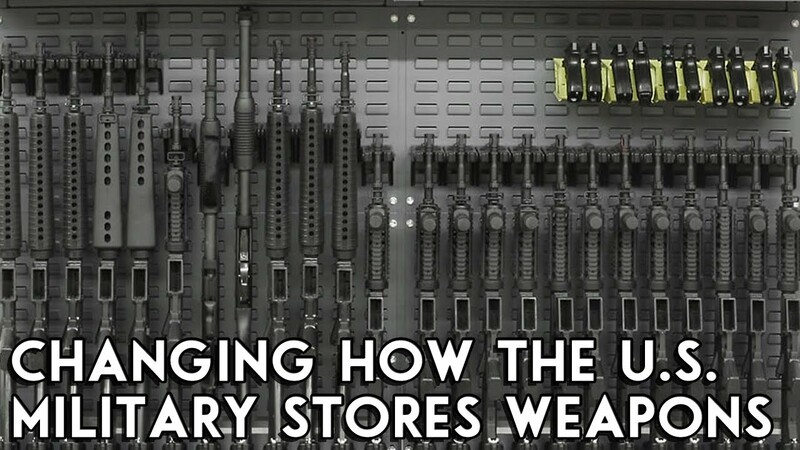 Also, you’ll hear how the idea of storing firearms for the military resulted in SecureIt becoming involved with the retail gun storage industry. When a soldier heads into battle, their rifle needs to perform as expected. For that reason, there is no room for damage or the possibility of future malfunction when a weapon is stored. With CradleGrid Technology and the design of our cabinets, firearms are stored safely. Straight-line access allows firearms to be stored in a clean row allowing for quick inventory or easy retrieval. Firearms are stored in a way that leaves no room for potential damage, overcrowding, or error. Store your firearms in the exact same cabinets we use in our military and law enforcement armory installations. These proprietary heavy-duty cabinets are available in a variety of configurations and feature CradleGrid Technology. In a sealed environment like a traditional gun safe, a large volume of ammunition can create a violent and dangerous explosion. With the diamond punch pattern on the front and sides, the 1824 cabinet allows ammo to cook off in the event of a fire. Another benefit of the cabinet is the 400+ lbs. of firearms, accessories, and gear. each shelf can hold. The cabinet is compatible with all of our CradleGrid accessories to give you unlimited storage flexibility. The Model 1824 Ammo Cabinet quickly adapts to any environment and can be reconfigured in minutes. Included accessories like the storage bin and the storage shelf can be quickly repositioned on the louvered back panel or placed on a shelf for additional organization. See more on the Model 1824 Ammo Cabinet at our shop page. If space is at a premium or your gun storage system needs to be flexible, the Model 44 is the answer. The Model 44 is designed to be 44 inches tall and also gives gun owners the flexibility to stack two as needed. This gun cabinet properly stores 12 rifles up to 41 inches in length and also provides storage space for accessories and gear. Compatible with all CradleGrid accessories, the Model 44 is extremely versatile for its compact design. Visit our shop page for more on the Model 44 Gun Cabinet . This 72-inch-high cabinet properly stores 12 rifles along with an assortment of gear. The cabinet also contains two adjustable shelves for accessories associated with specific firearms. Model 72 gun and gear cabinets are also able to quickly adapt to any weapon system in minutes without tools. Gun owners have the ability to fully customize this versatile cabinet with shelves and a variety of CradleGrid accessories. Head to our shop page for the Model 72 Gun Cabinet today. Military and law enforcement armories around the world have been using the Model 84 gun cabinet. It is also the product that helped SecureIt launch into the gun storage industry. This 14-gauge steel welded cabinet provides gun owners with ultimate adjustability. The cabinet can be re-configured to meet your storage needs and is also compatible with all CradleGrid accessories. In the past, we would overrun production on larger contracts of the Model 84 to offer a discount to our e-mail subscriber base. Now, with the increase in U.S. government spending and the steady boost to our foreign military sales, we are now able to offer the Model 84 to the general public at lower the price. See all Model 84 cabinet configurations by clicking here. Shop our full Military Cabinet selection today.